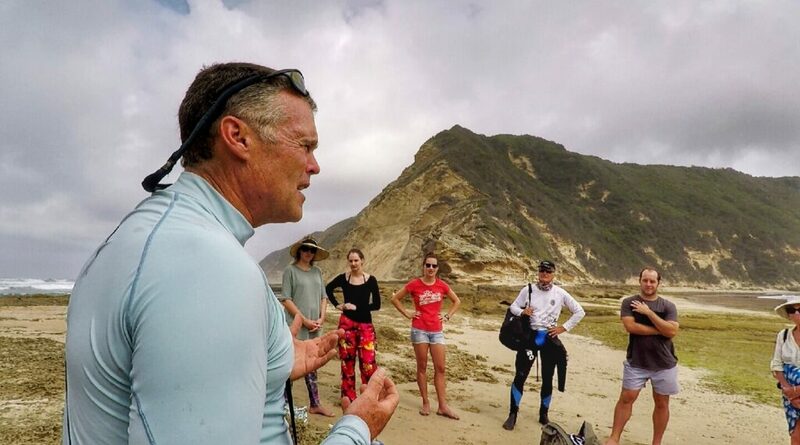 Local Ocean Warriors Tackle the Problem. It’s a sublime summer’s day with calm seas and cobalt blue skies overhead. A lone fisherman casts his line just off the reef of Gericke’s Point, the iconic Lion’s Head standing sentinel over the intertidal wonderland which surrounds him. Suddenly, the fisherman feels a tug on his line and for a brief moment he thinks he has a bite. He quickly realises however, that his fishing line has merely been snagged on the rocky reef in front of him and despite his efforts he is unable to free it. So, he reaches for a pair of scissors and cuts it. He then commences to set up his rod once again without another thought except perhaps for a tinge of annoyance over the gear that he’s just lost. The scenario played out above may seem normal and perhaps even unavoidable, but that lone fisherman’s snagged gear has the potential to bring about a very sinister cycle of events which occur out of sight beneath the ocean’s surface. It is a phenomenon known globally as ‘ghost fishing’. 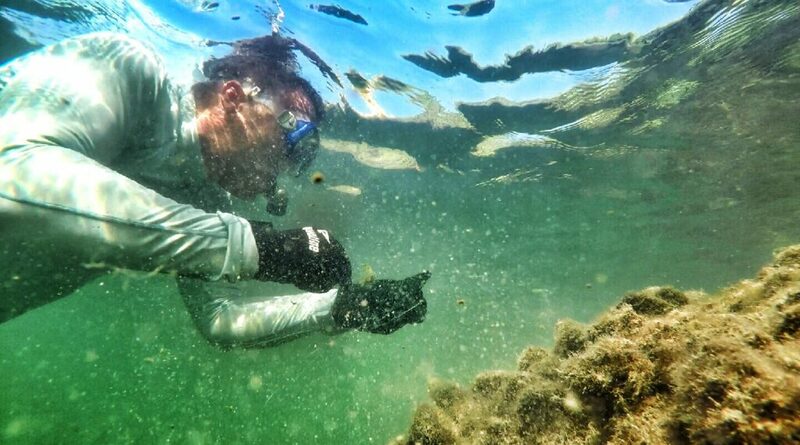 Mark carefully working to dislodge the fishing tackle off the delicate reef. Ghost fishing occurs when fishing gear has been lost, dumped or abandoned. While long lines and nets from fishing trawlers wreck the most havoc in this regard, recreational and subsistence fishing also negatively impacts on our sensitive underwater realms. 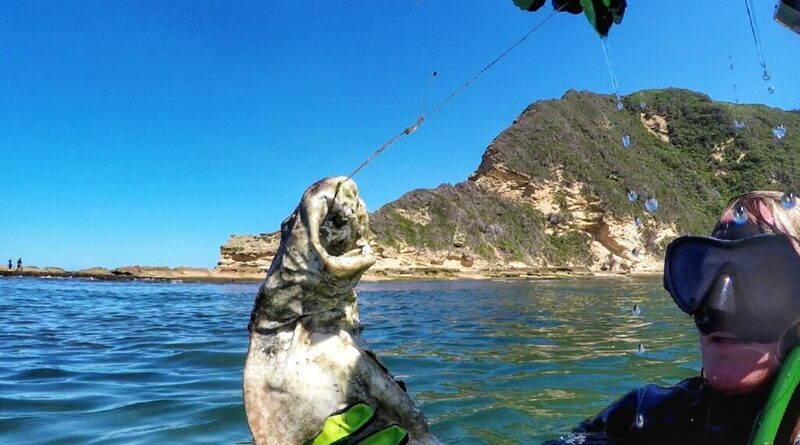 Once the line has been snagged and then cut, the hook is often left suspended in the water with the bait still attached. A fish then takes the bait, gets hooked and dies. Once that fish is dead, its decomposing flesh lures other marine life, and so the cycle continues. Studies have shown that one snagged line has the potential to kill up to 10 fish. Mark bringing up some lost tackle from the reef off Gericke’s Point. What lies beneath the surface remains largely unseen and it is usually only marine scientists and recreational divers that get to witness first hand the havoc caused by ghost fishing. This was the case for Mark and Amanda Dixon, passionate conservationists and owners of Garden Route Trail. 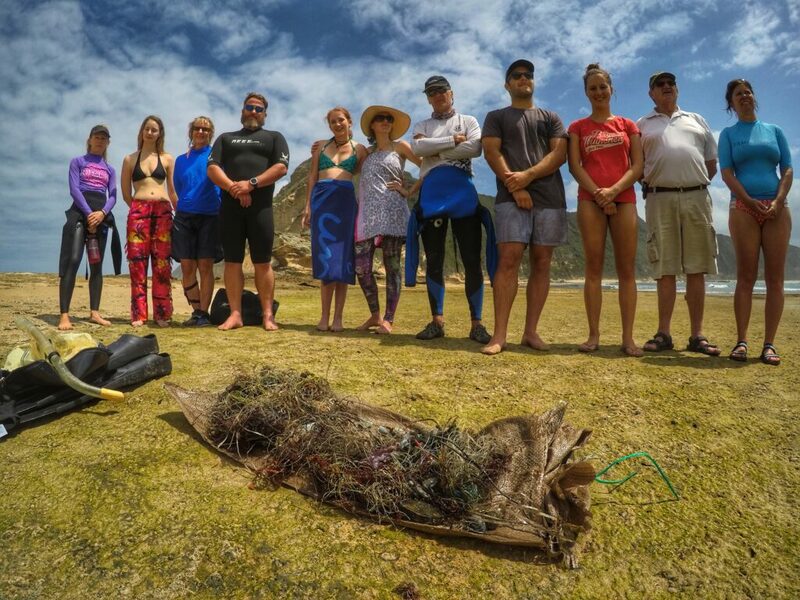 They have recently added snorkelling tours to their diverse nature-based guided tour repertoire and after conducting several snorkeling and freediving tours off the reef at Gericke’s Point over the season, they were shocked and saddened to see how much discarded fishing gear littered this local reef. Mark has since dedicated a lot of time and energy not only educating the general public (read his interesting blog) about this environmental issue, but he has also rallied together like-minded ocean warriors to clean up the copious amounts of snagged fishing gear from our local reefs and waterways. “To date, we have done seven salvaging dives”, explained Mark Dixon. 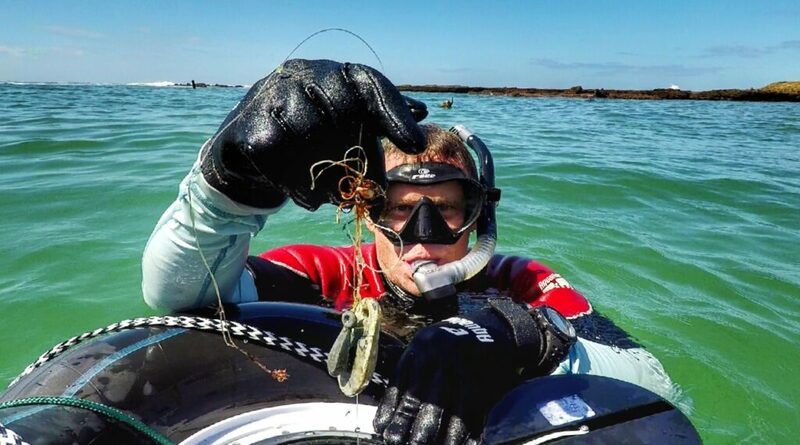 “Our focus areas have been Gericke’s Point, Kingfisher Creek in the Sedgefield Lagoon and the Paquita Wreck in the Knysna Estuary.” It is mind boggling how much snagged gear has been recovered thus far. 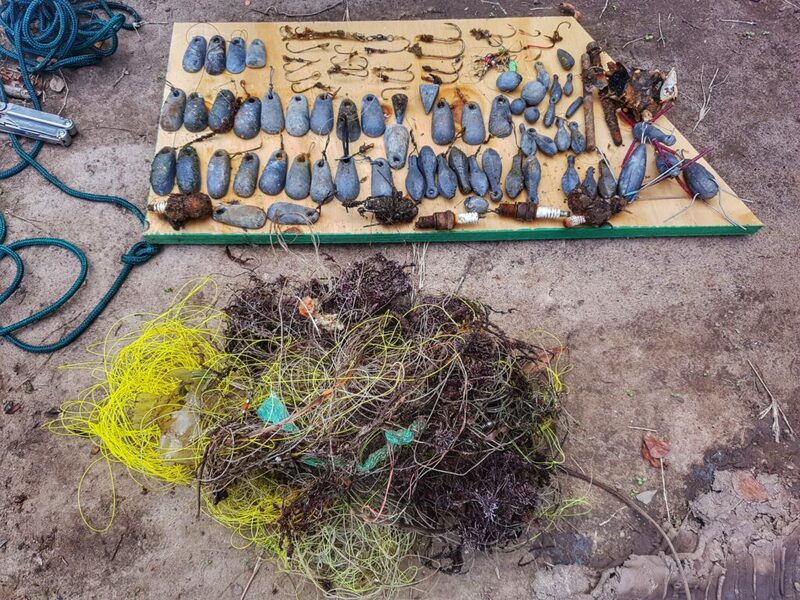 From Gericke’s Point alone, Mark and his group of volunteers have collected 18,5kg of sinkers (189 weights and 22 spark plugs) and 100’s of metres of fishing line from just three dives along a small 100m transect. This is the salvaged fishing gear from ONE dive off the reef at Gericke’s Point. A snagged pyjama shark, the sad reality of ghost fishing. Salvaging lost fishing gear and cleaning up our waters has become a serious priority for the Dixon’s and one of their first objectives going forward is to register an NPO and to work on procuring funding so that they are able to roll out a more comprehensive awareness programme on the impacts of recreational and subsistence fishing. They are also researching the possibility of making jewellery or art pieces with the salvaged gear, the profits of which would be generated back into the project. Mark Dixon explaining the realities of ghost fishing to the salvage divers.